is a poignant, touching story for all ages. 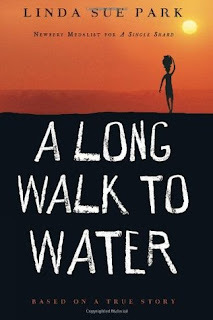 A Long Walk to Water by Linda Sue Park is technically a middle grade book but in my opinion it is a story that everyone would benefit from reading. 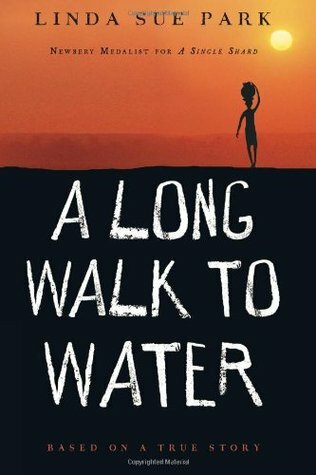 It's a short, quick read told as two alternating stories - that of a young girl Nya living in the Sudan in 2008 and a young man Salva from 1985. Both of their stories are unequivocally compelling, emotional and inspirational. Nya must walk hours each day to a far away well to simply get water for her family. Salva's story told in turn, is simply heart-wrenching. His village is attacked and he is separated from his family in the turmoil and chaos that follows. Salva's journey is fraught with loss and tragedy but also unwavering hope and courage. It was unimaginable to me to think about the horrors children face when they are displaced from their homes, separated from their families and forced to live in refugee camps. Salva's sheer will to survive was inspirational. I don't know how I'd cope in such a situation but his determination was admirable. I loved how these 2 seemingly unconnected stories intertwined poignantly in the end. For a such a short, quick read this book certainly makes an enormous impact. It is difficult not to feel empathy for these characters as we are touched by their stories. This is one story that I highly recommend reading & discussing with the children in your life. Nice blog. The article contains some vital ideas. Every reader can easily follow this blog. The all content provided here is really nice. I am so glad to view this content. It provided many vital ideas to me. All the content is arranged very well. The step by step method is provided here. It is so simple to follow this blog. All ideas are arranged very well. Every idea is so good. The arrangement of content is nice. This is an excellent blog. The entire contents mentioned here is easily applicable. All readers can easily follow this blog. The point to point explanation is included here .It is essential to follow this blog. The whole reader gets good tips from this. There is a dark side. The deal of this is not so easy. The sample examples provided in this blog is good. The idea is easy to read. Every idea is simple to read. Keep sharing this idea. I get some extra information from this blog. The simple content is easy to follow. Every reader can easily follow this article. The sample content on this blog is vital. The vital readers can easily follow this blog. The tips provided on this article are simple to read. Know more custom essay purchase.The sample examples provided in this blog is good. The idea is easy to read. Every idea is simple to read. Keep sharing this idea. I get some extra information from this blog. The simple content is easy to follow. The all element is really good. I visited many blogs to get some design. But I never see a blog like this. This blog keeps a high quality. This is so inspiring blog. It notes the vital role of learning. There is a lot of content to learn from this. All ideas are really good. The good and effective ideas are provided here. The article keeps a high quality. All reader may get some typical ideas. Extra ideas can be easily got. This is so inspiring to learn more ideas. For academic research this type of content is may need.